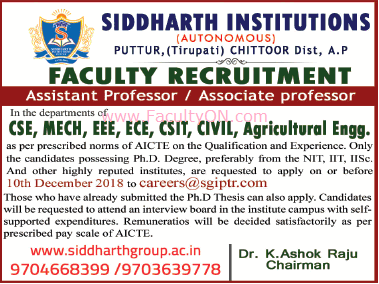 Siddharth Institutions, Puttur has advertised for recruitment of Teaching Faculty- Associate Professor / Assistant Professor jobs vacancies. Interested and eligible job aspirants are requested to apply on or before 10th December 2018. Check out further more details below. About College: Siddharth Institute of Engineering and Technology is a popular engineering college in Puttur, Andhra Pradesh, India. It is approved by AICTE and is ranked among the top 100 engineering colleges by AP.